1) The bees are NOT on the attack. Before they leave the hive, the bees fill up on honey and are much too full to get very angry very fast. This of course does not mean you should try to provoke them. 2) DO NOT spray bees with anything. Even water can harm the bees. 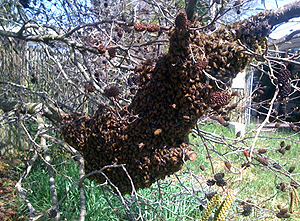 Once a hive has been sprayed, the bees are angry and sick. If you have hive living in a structure or a tree, simply spraying the bees will not fix the issue. The best option is to call a beekeeper who has a lot of experience removing bees and do it safely and professionally. Thank you so much for helping to save the bees!